collecting-duct carcinoma is a rare, often lethal form of carcinoma. medullary carcinoma associated with sickle cell trait, has emerged as a distinctive tumor showing some overlapping features with upper tract urothelial carcinoma. mucinous tubular and spindle-cell carcinoma and tubulocystic carcinoma were earlier considered as patterns of low-grade collecting-duct carcinoma, but are now recognized as separate tumor entities. carcinomas associated with somatic translocations of TFE3 and TFEB comprise a significant proportion of pediatric renal carcinomas. 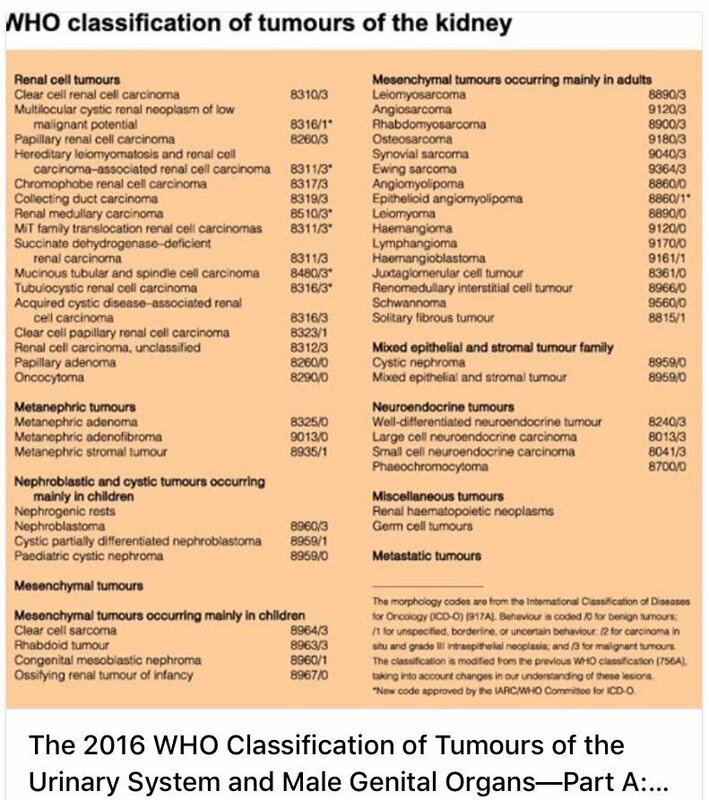 oncocytoid renal carcinomas in neuroblastoma survivors was recognized as a unique tumor category in the WHO classification. 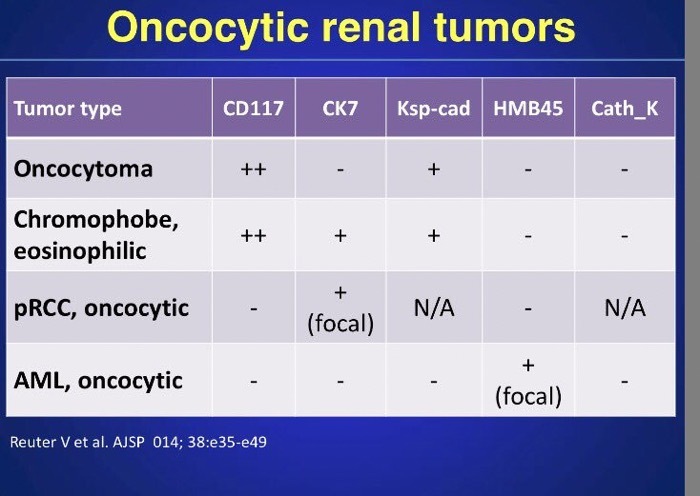 renal carcinoma associated with end-stage renal disease is now recognized as having distinct morphological patterns and behavior. Clear Cell RCC expresses vimentin, a variety of low molecular cytokeratins, EMA, CD10 and RCC MA. 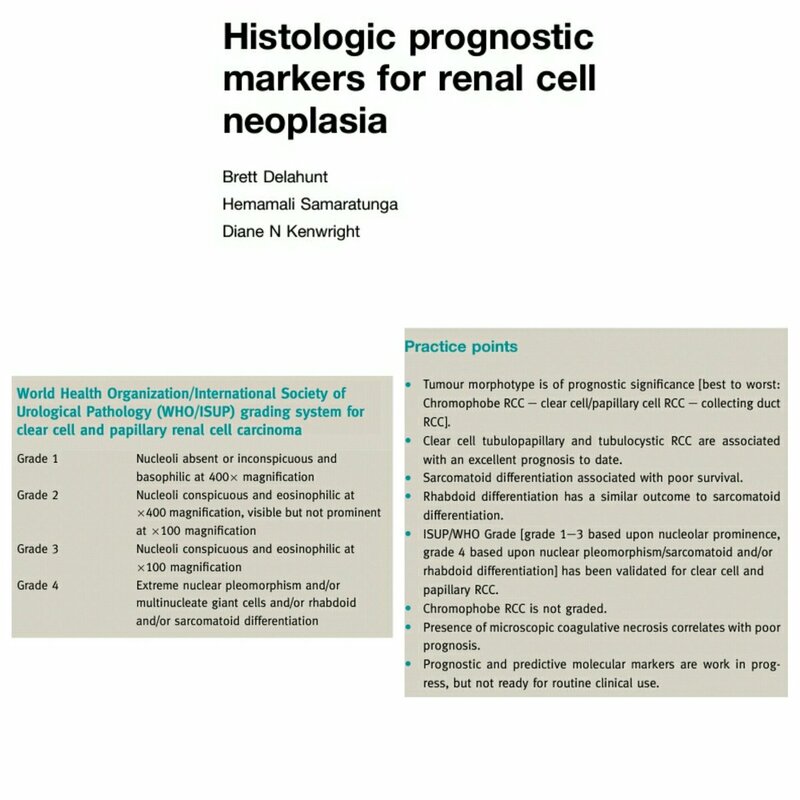 The latter two have some diagnostic utility when a RCC is considered in a metastatic lesion. 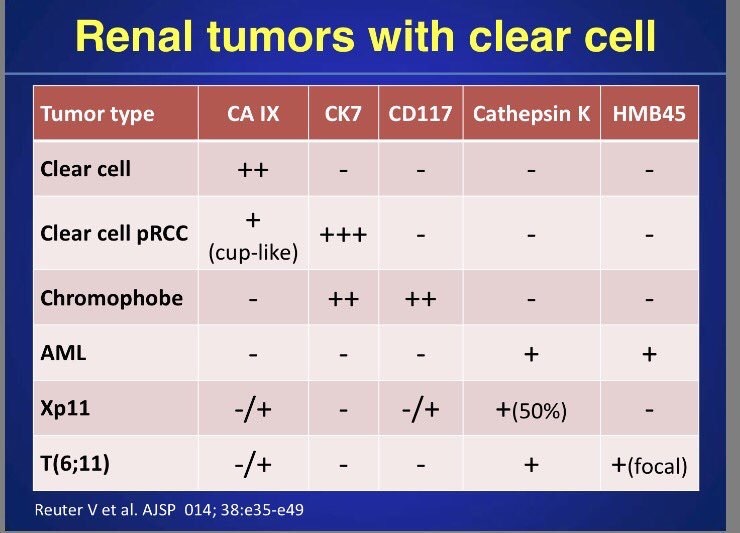 Notable cytokeratin exceptions in CC-RCC are CK7 and high molecular weight cytokeratins. 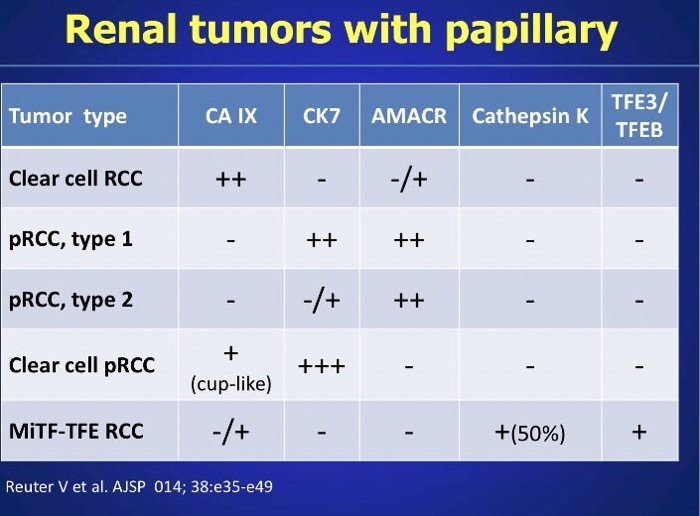 Cytokeratin 7 coupled with AMACR (a-methylacyl-CoA racemase), is useful when solid forms of Pap-RCCs are encountered. 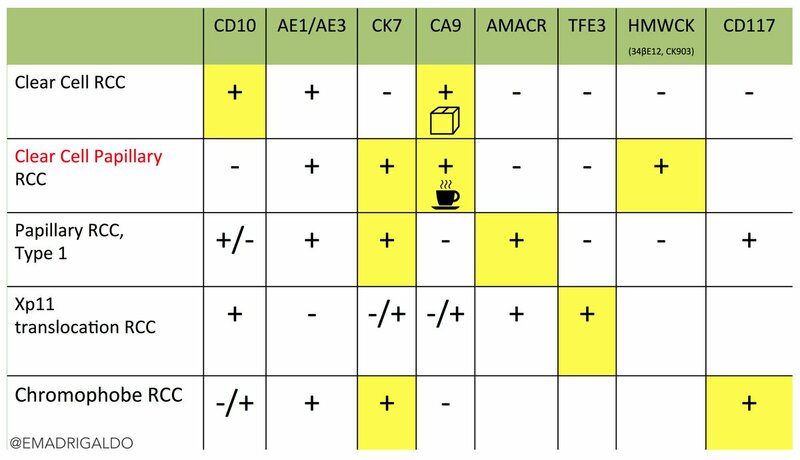 Several antigens, some uncommonly stocked in immunopathology laboratories, such as parvalbumin, S100A1, caveolin-1, C-kit, PAX2 and E-cadherin have discriminatory efficacy in separating CC-RCC from Ch-RCC. 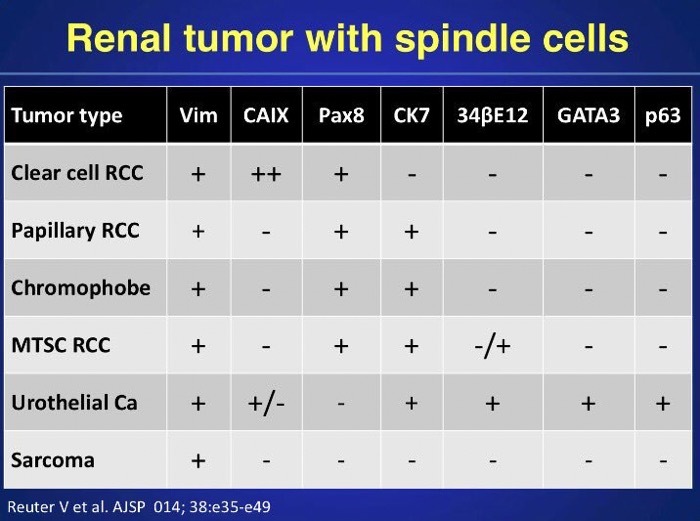 However, the first line strategy for Ch-RCC should be to stain for CI. For urothelial carcinoma the presence of high molecular weight cytokeratin, CK 7 and p63 permit confirmation of the diagnosis. Xp11.2 translocation carcinomas are a group of neoplasms characterized by a variety of break points at Xp11.2 with translocation to one of several other chromosomes forming fusion genes. They occur most frequently in children and young adults. Although histologically variable, the most common tumor cell phenotype are clear cells with voluminous cytoplasm and papillary architecture. Intracellular and stromal calcifications provide additional useful clues to the diagnosis. 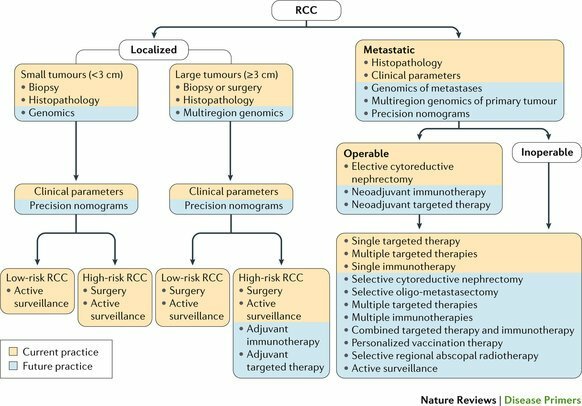 In general the absence of epithelial markers in translocation carcinomas are powerful clues to the diagnosis. However, a positive reaction for the nuclear transcription factor TFE3 is definitive in the absence of cytogenetic confirmation. Some cases may also stain for melanocytic markers, but this is more common in TFEB positive t(6:11) translocation carcinomas.